These were sent to me today. I am being told they are of the next generation Chrysler Minivans. No one seems to be 100% sure yet if Chrysler or Dodge will be getting the minivan. 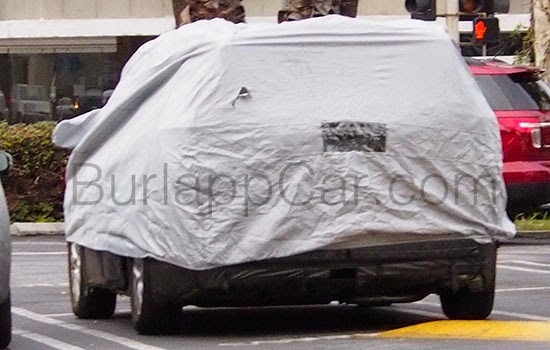 But even under that camouflage, the shape seems quite slick for a minivan. I don't know if I like the loose-fitting grey vinyl roof coming all the way down to the fender skirts. Would it be available without that? I did a focus study 2 years ago on the prototype and it definitely is the best looking exterior of any minivan. The front looked very much like the new Chrysler 200's styling, but the back is completely unique with the glass that wraps around in black from the tailgate to the sides... if they kept that. That was the most controversial discussion in the focus group. Inside it was getting the floating LCD display that is more common in Mercedes & BMW. It wasn't retractable into the dash though. That was also an uncertain item as the focus groups were very divided on that. Display was the customizable LCD screens. They were discussing some very high MPG goals at the time, but that would be in line with the reports of a plug in hybrid version. Here is the new Buick Verano, Vince!